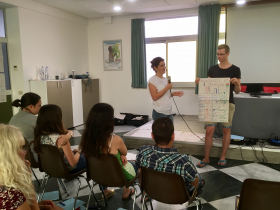 EYCE training course “Role of Churches in Modern Society” took place from 6th -13th August 2017 in Palermo, Italy. The event gathered together twenty young Christians from Armenia, Czech Republic, Denmark, Estonia, Finland, France, Germany, Hungary, Italy, Lebanon and Romania. The participants represented also a variety of denominations including Baptist, Lutheran, Eastern and Oriental Orthodox, Reformed, United and Waldencian. The diversity of the backgrounds of the participants offered the event an excellent starting point to explore the current role of churches in society and to develop a common vision on the future. 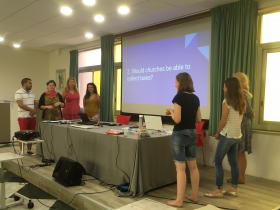 The main aim of the event was to bring together young Christians, the potential future church leaders, and to develop a vision of the role of churches in modern, increasing secular and diverse society. To learn first about the situation in different countries around Europe, the participants created posters about their home countries. The presentations had a lot of interesting and new information. Deeper dive into the topic was offered by guest speaker Katarina Valcova, theologian from University of Zilina, Slovakia, who told about the historical development of church and state relationship and helped to understand the roots that have led to the current models. Where do you stand? -excercise at Churches and Politics session with Lukas Meyer. The second guest speaker in the event was Lukas Meyer from Germany, who does research on the role of Protestantism in EU. His topic was churches and politics in Europe and the interactive presentation gave the participants lot of food for thought on how and why the role of churches is in the European decision making and advocacy as well as how the relationship between the ecumenical structures and European institutions has developed. The presentation was also a good starting point for further investigation of themes, on which the different churches are active on, such as diaconal work, promotion of social justice and human rights, helping refugees, education and mission. During a Bible study the group explored four different passages from the Bible. 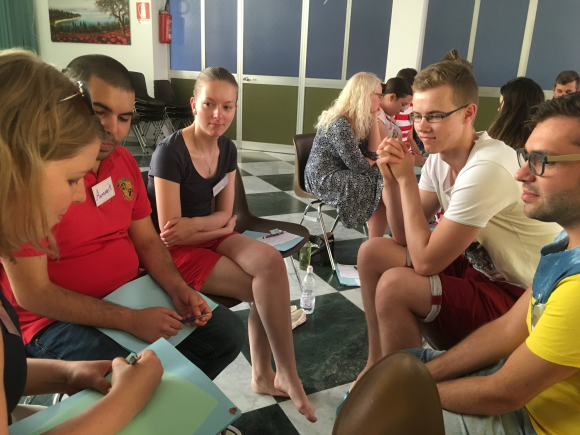 Group discussions were presented with creative methods, such as acting, summarizing the passage into hashtags and by silent discussion in writing. An important part of the training course was also the ecumenical learning and enriching spiritual life. 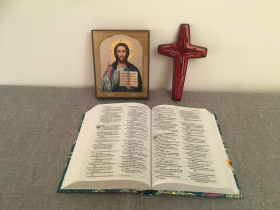 The morning and evening prayers were prepared in small groups and they were presenting both characteristics of the different denomination as well and different kinds of spiritual traditions. 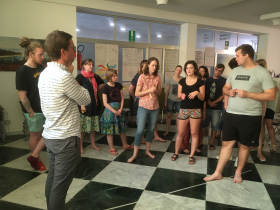 During evenings we had both intercultural and Italian evenings, during which we shared some local food, learned traditional dances and played a variety of games. 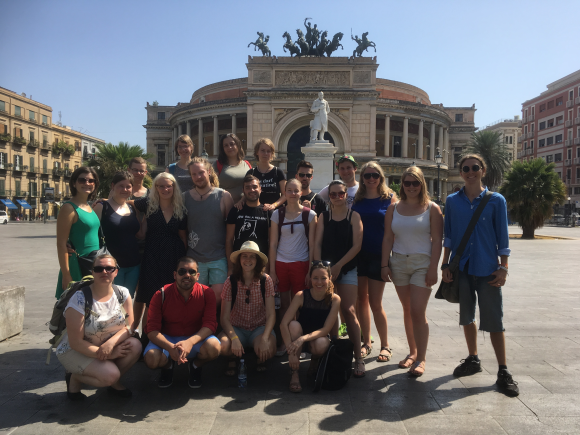 Towards the end of the week it was time to head outside the venue La Noce and to explore the city centre of Palermo. With the heatwave that had hit Sicily and temperature of +36 C the walk was quite exhausting but also rewarding – especially the view from the rooftop of the Cathedral. The excursion day was however not only about sightseeing but we also met Gaetano Pennino, manager of the Cultural Heritage Department in the region of Sicily. With him we had the chance to learn more about the cooperation between the city and the churches in Palermo. The last task for the day was to interview people about their point of view concerning churches in modern society. Surprisingly there were a lot of people, who were willing to answer the questions and from the interviews we could create a short video. 1) We firmly believe that the churches have an active role to play in their respective societies based on the God-given call and core values of the Gospel. Hence they have a significant role in encouraging good citizenship. 2) The churches should represent God’s kingdom on earth. Therefore, they are called to stand by the needy, the vulnerable and the marginalized in society. 3) As the body of Christ, dedicated to work for justice, peace and integrity of creation, the churches should take part in developing communities based on mutual acceptance, dialogue and love. 4) The churches should witness for truth and righteousness by speaking out bravely against injustice at all places and times. 5) We encourage every Christian to actively participate and take responsibility of being a witness of the Gospel and act for transformation. We as members of our churches have this as our commitment. This successful event could not have been organized without motivated participants! EYCE would like to thank also all the guest speakers for their enriching contribution to the training course, as well express our deepest gratitude to all our partners and donors, who made this event possible: FGEI, Diaconia Valdese and Otto per Mille from Italy, the Evangelical Lutheran Church of Finland and the United Methodists Church. Thank you! To see more photos from the event, check EYCE Instagram!